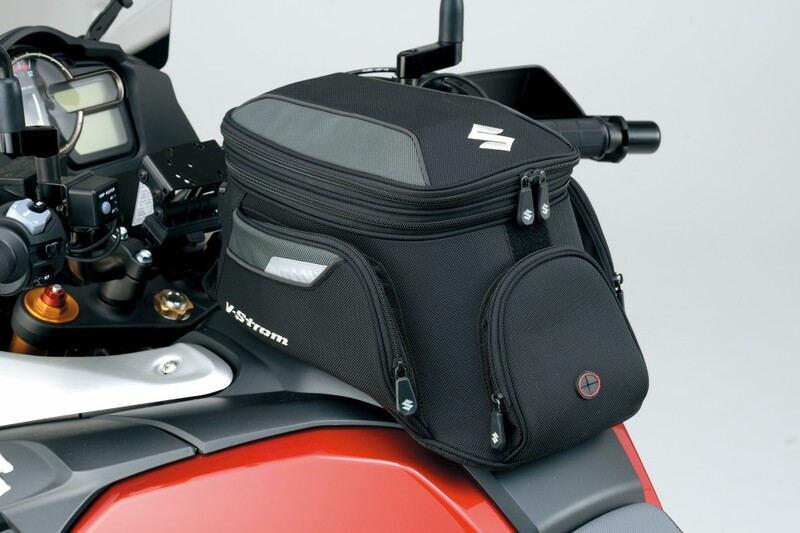 Ostensibly, the Suzuki V-Strom tankring tank bag is an official accessory item for use with both the V-Strom 1000 and the V-Strom 650. But we'll let you in on a secret: it is appropriate for any number of adventure-style motorcycles, including the BMW R1200GS, the KTM 1190 Adventure, the Kawasaki Versys 1000, and so on. It's so versatile because this is, in fact, a SW-Motech Quick Lock EVO City bag that's been given Suzuki branding. And that's a good thing. A very good thing. SW-Motech gear is top-of-the-line stuff. Made of 1680D ballistic nylon, it is rugged as hell. Holding 11 liters of stuff and expandable to 15 liters, the bag has one main compartment and three smaller external pockets –– one in the front (i.e., facing the rider) and one on each side. The bag attaches to the bike via a simple lock ring that you bolt to the tank ring. Motorcycling luggage is usually so strap-, hook-, or button-intensive that it's hard to believe something could work so easily. But it does. The bag just clicks on. To take it off, pull a wire loop located at the front of the bag. Sin problemas. Within the main compartment, along its side walls, are four elastic mesh pockets each large enough to hold an iPod. Within the bag's lid is a small, zippable mesh pocket. Toward the back of the bag (i.e., facing the motorcycle's dash) there is a small rubber port hole to allow you to run wiring into/out of the bag. There is a similar port at the front of the bag. The zippers are sturdy with large rubber-coated tabs that are easy to grab with gloved hands. To keep them from flopping around, the tabs for the front and side pockets can be tucked behind small elastic bands. The zippers for the main compartment don't have such a band but are placed in such a way that they won't catch on clothing or touch the bike. Additionally, the zippers for the main compartment can be locked via a small luggage lock of the sort we all used to have on suitcases before the TSA decided it needed easy access to our underwear. As far as a tank bag goes, this is just about as good as it gets. It's easy to use, practical, and looks good on the bike. Especially on an adventure motorcycle, it fits the aesthetic. Some assembly is required. That may create stress for people who aren't strong do-it-yourselfers, but it's actually pretty easy. And fortunately the incredibly useful website webBikeWorld has clear step-by-step instructions and photos to help ensure you get it right the first time.